Hundreds of fans turned out to pay tribute to world motor racing champion Geoff Duke in the Isle of Man. The coffin of six-time world motor-racing champion Duke was driven on a lap of the TT course ahead of his funeral on Sunday. The 92-year-old from St. Helens, who dominated his sport in the 1950s, died on 1 May at a nursing home in Douglas. A hearse left the TT grandstand on Glencrutchery Road in Douglas at 14:30 BST followed by family members. Bikers and fans followed the procession around the course. Duke was the first major star of motorcycle racing and was awarded an OBE in 1953. 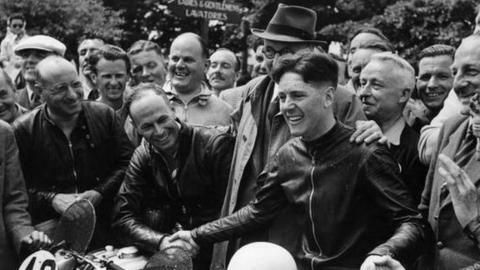 He won six TT races in the 1950s and was the first rider to wear one-piece leathers. It is hoped that a service of commemoration will take place during the Festival of Motorcycling in August.